I felt very lucky on my birthday last year – lucky to have a friend so lovely that she bought me a return ticket to Paris on the Eurostar. We decided to go in late January for a couple of nights, which gave us a lot to look forward to following the December Christmas celebrations. We stayed at Hotel Pont Royal for the first night and moved up north closer to the station for the second. We caught the early Eurostar train from King’s Cross and three hours later arrived at the hotel where we checked in and dropped our bags off before heading straight out to wander around the streets of Paris. 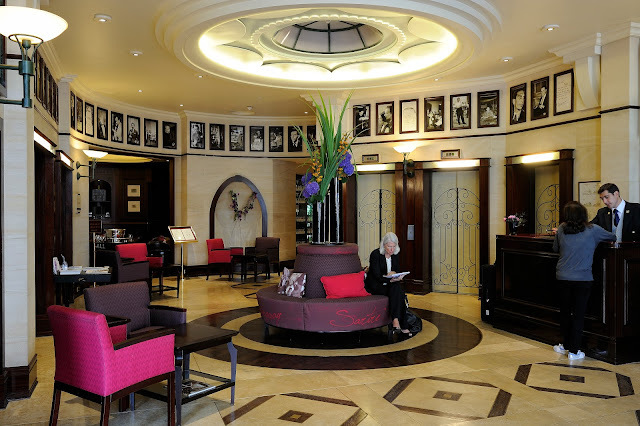 While we were waiting to check in, we glanced up and saw pictures on the wall of famous American intellectuals, who back in their heyday made Hotel Pont Royal their Paris home. The cocktail bar was a thing of beauty – dark and lavish and we learned it was one of the leading cocktail bars in Paris from the 1920s and frequented by the likes of F. Scott Fitzgerald and Hemingway plus a range of artists. On our travels, we noticed that the neighbourhood still caters for the arty Parisians. We passed a plethora of galleries on our walk to a quaint little cocktail bar, where we enjoyed a nightcap. The streets were bustling with good looking and very smart locals who were enjoying late night gallery openings and a few drinks to go along with it. We were shown to our room and upon entering I thought it was small but cosy. As if the host could read my mind, he quickly told us of the differences between the old and new hotels in Paris – the old ones tend to have smaller rooms than the newer ones but with the old ones comes history like no new one can rival. As soon as he left the room, my friend pulled ‘The Adulterous Woman’ by Albert Camus out of her bag, as if she knew all along that she might be staying in the same room as one of her writing heros. The facilities provided were everything we needed, although there was one thing missing… a kettle. We were both slightly surprised that we couldn’t make a cup of tea or coffee in our room, but maybe that’s just the English in us. We were happy to have a TV with BBC stations, including digital radio stations, a hairdryer, lovely aloe vera toiletries, dressing gowns and slippers. There was also an option of room service 24 hours a day from the hotel kitchen or until 11pm from L’Atelier Joel Rubichon, which was situated next to the lobby of the hotel. 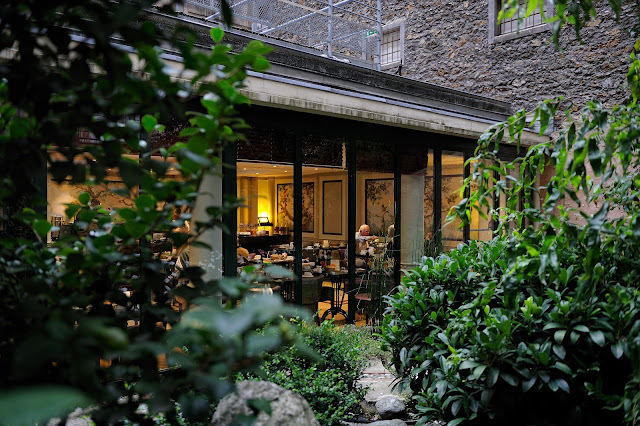 We weren’t in the hotel for very long during our stay, but it served as the perfect base for a day – we explored the surrounding area, taking a walk past the Louvre, all the way up to the Champs Elisee and visited a little gem of a restaurant for lunch. Had we have been staying longer, we would have put the gym room to good use and no doubt enjoyed a cocktail in the downstairs bar. The morning of our departure, we woke at 7am and headed downstairs for breakfast, which was served in a quiet dining room on the ground floor and we enjoyed the range of food on offer, from French sweet breads to creamy scrambled egg, yoghurt, cereals and fresh rustic French bread. Very full and extremely satisfied, we checked out quickly and smoothly and wandered deeper into the heart of Paris, ready for the next two days of adventure that awaited us.